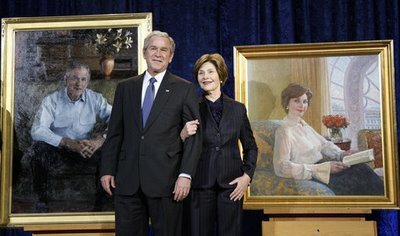 Robert Anderson of Darien, Connecticut, who studied at Boston’s School of the Museum of Fine Arts, painted the portrait of George W. Bush that the president unveiled at the Smithsonian’s National Portrait Gallery yesterday. Anderson, a classmate of the Bush’s at Yale, was selected by the White House and commissioned by the Smithsonian. Pictured: George and Laura Bush stand in front of their portraits yesterday after the unveiling. Photo by Eric Draper.